Selection: Good. Plenty of recordings, covers all the basics but still small compared to the biggest sites. Emails: Most emails are pretty helpful. No spamming! Best used for: A quick pick-me-up. The induction is definitely the strong point of the recordings. Jon Rodes is just so real and genuine, plus he has a very melodic way of talking that is very hypnotic and calming (he is also a musician, which is definitely what why this is possible). The effect after listening is powerful calm, perhaps even to a very pleasurable level. That’s a great sign. Price is also a strong point, as they offer some of the cheapest professional recordings on the web. Jon Rhodes is very approachable on social media. Always a big bonus, so you can get help any time you have a question about your progress with a hypnosis mp3. I have reached out to him multiple times, and he always gets back to me (even without knowing that I am doing a review on his business). Looking at all of these factors, you can really tell that Jon cares about you very much and his one intention is to help create a better world for you. Its that genuineness that has given him all that success he has. It’s quick. It works. What more do you want? The website looks a little older, but it’s fully functional. They only take Paypal at the time of writing this, which means you can also purchase through Paypal’s credit card option. That can be a little bit of a confusing ordeal though, especially if you don’t already have an email associated with a paypal account. Most websites today will offer a separate credit merchant to make it easier for customers (psst! Stripe is a really great payment platform for this). The recordings also have a super low bitrate, which can leave some audio artifacting and quality issues. Actually, they sound surprisingly good for 56 kbps, but it should really be higher than this. They likely do it to reduce the amount of file data needed, but really, who doesn’t have an extra 20-30 Mb for an audio file? You’ll notice it if you’re an audiophile with decent headphones. In our Hypnobusters review, we found all the basics, but pretty much just the basics. Health improvement, sports performance, sleep, stress relief, phobias, etc. Look elsewhere if you need something really specific. They offer subliminals and binaural beats too, if you’re into that. You’ll receive emails from hypnobusters if you buy from their site. The emails are helpful, generally sending you info about hypnosis and related issues. They will often link to a helpful blog article. Very little spamming, and they are very considerate. Something you can appreciate. Don’t forget that you can always unsubscribe from any email list. This is pretty much for everybody. If you are new to hypnotherapy online, you should start with these guys, because they do a fantastic job, are some of the highest rated all over the internet, and the prices are great. There may be other hypnotherapists that you have a special interest in, but other than that, you just can’t go wrong with these guys. This track is great, but the most popular work from Hypnobusters is this particular weight loss pack. If you’re looking for hypnosis to lose weight ,Gastric Band Hypnotherapy is a relatively new technique that is becoming extremely popular, and is now one of the most common ways people do hypnosis. It’s an effective way to make you eat less by making you feel like you have had a gastric band operation to close up part of your stomach. Without thinking about it, you have used hypnosis to lose weight! 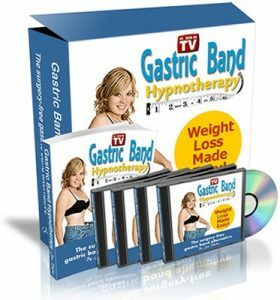 Gastric band hypnosis is becoming more popular every day because it is just such an effective way to lose weight with hypnotherapy. Yes, weight loss hypnosis is kind of boring compared to the rest of the hypno-world, but at least it has been proven to work effectively, a million times over. It may be the easiest, safest, and most useful fat burning technique on Earth. It’s the bread-and-butter of hypnotherapists. That said, I’m surprised that it still isn’t very well known. With obesity being such a hugely detrimental issue today, everyone needs to know about this secret! (I wish it wasn’t a secret, that’s why I’m telling you about). I recommend this simply because they offer the best price for a ton of content, and Jon Rodes is one of the highest acclaimed hypnotherapists on the web right now.